This campsite lies in the midst of natural beauty, surrounded by pine forests and mountains. There are plenty of outdoor activities and you’re only a couple of steps away from the river. There are short trekking routes that take you through pine forests to a sparkling waterfall, and the evenings at the campsite are lively with a bonfire and snacks. 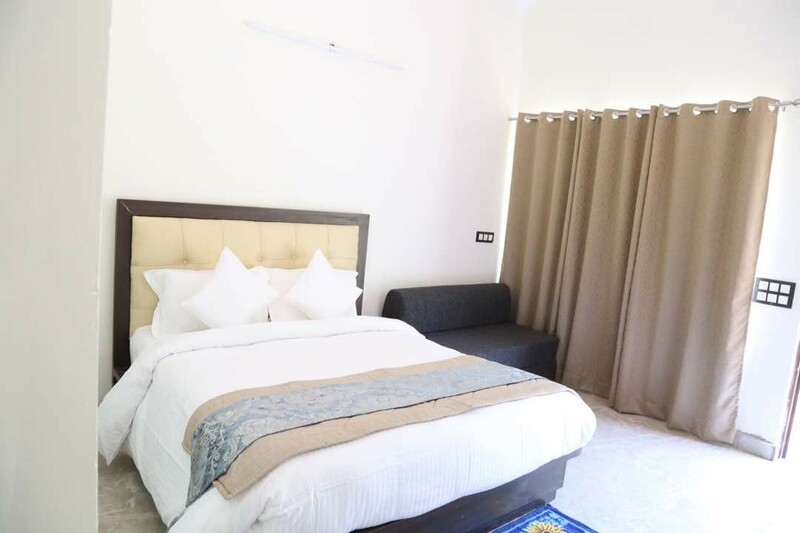 You’ll sleep in a plush air-conditioned cottage with French windows, with an attached washroom with all fittings, private sit-out, and luxurious interiors. The real adventure however, is the thrilling rafting session on day 2. You’ll be battling the churning currents of the mighty Ganges as your raft bounces about on the exciting Grade III rapids. Once you get to calmer waters, you can also do some cliff-jumping and body surfing. 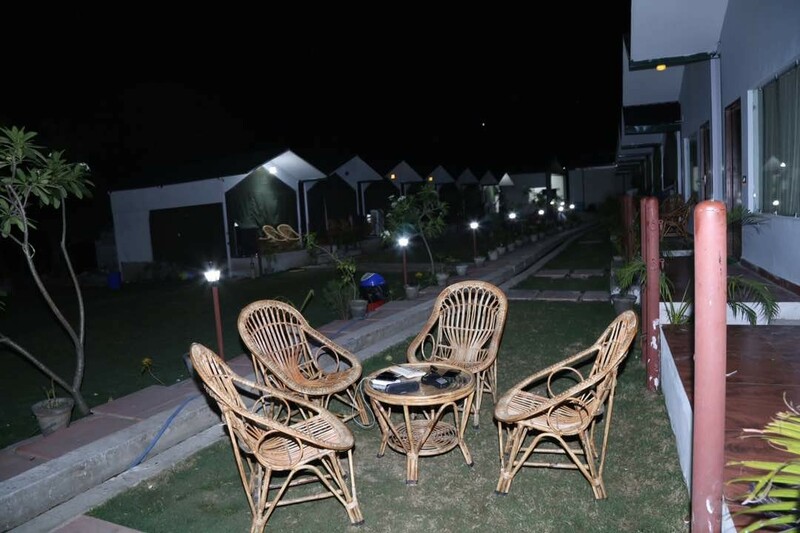 Located on Neelkanth road in Rishikesh, this campsite is peaceful and gives you a chance to escape to nature. You’ll be staying right beside the river Heule and will be able to walk down to dip your feet in the water any time you want. There are a variety of on-camp games like volleyball, cricket, softball, badminton, and carrom. • Battle exciting Grade III rapids of the Ganga River. • Take a dip in the cool waters of the Heul River. • Trek to a sparkling waterfall through pine forests. • Indulge in fun outdoor games like volleyball, badminton, cricket, etc. • Unwind around a blazing bonfire with light music and snacks. Smoking, chewing tobacco or consuming alcohol or drugs is prohibited before rafting in Rishikesh. Littering is strictly prohibited in and around the campsite or near the water bodies. You must adhere to the instructions of the rafting instructor at all times. For cancellations made 30 days or more before the check in date of the Rishikesh rafting trip: 75% of the total trip cost will be refunded, minus any cancellation charges. For cancellations made 15-30 days before the check in date of the Rishikesh rafting trip: 50% of the total trip cost will be refunded, minus any cancellation charges. For cancellations made 0-15 days before the check in date of the Rishikesh rafting trip: No refund. Requests for additional meals and transport will be entertained with prior notice only. In case of injury, damage to self or property or death, the operator will not be held responsible. Rafting in Rishikesh is arranged considering normal weather. In case of unforeseen weather conditions or government restrictions, certain activities may be cancelled and in such cases the operator will try to provide an alternate feasible activity. However no refund will be provided. There will be no refunds or discounts given for services unused or missed due to traveller's own fault, negligence or breach of terms. Participants are responsible for their own belongings and the campsite is not accountable for any loss or damage. There is no pick-up point for this Rishikesh rafting trip. There is no drop-off point for this Rishikesh rafting trip. Arrive at the campsite where you'll be greeted with a non-alcoholic drink. You'll drop your luggage off in your cottage and head for a delicious lunch at 13:00 hours. The rest of the afternoon is free to explore the surroundings, go on short hikes or to try some fun outdoor games. You'll be served tea and cookies in the evening and you can head for a quick dip in the Heul River after. The evening is lively, with a bonfire and snacks and you'll enjoy a delicious dinner before retiring to your comfortable cottage. Enjoy a day of fun at this campsite in Rishikesh. Wake up by 07:00 hours and go for a lovely walk in the misty morning. You'll enjoy a hearty breakfast at the campsite before packing up and checking out. You'll avail a transport from the campite to Laxmanjhula where you can drop off your luggage at the operators site office. You'll be driven to Shivpuri and from where your exciting rafting session begins. You can also try cliff jumping and body surfing and after that, your trip ends. Head out for a day of rafting fun on the Ganges. Personal expenses such as extra meals, packaged water, soft drinks, etc. Overnight stay in Swiss tents. You'll be greeted with a non-alcoholic drink upon your arrival and in the afternoon, you'll savour a delicious vegetarian meal of rice, chapati, rajma, aloo jeera, matar paneer, raita, salad and pickle. For dinner you'll have a similar menu as lunch, with one chicken dish as well as dessert. 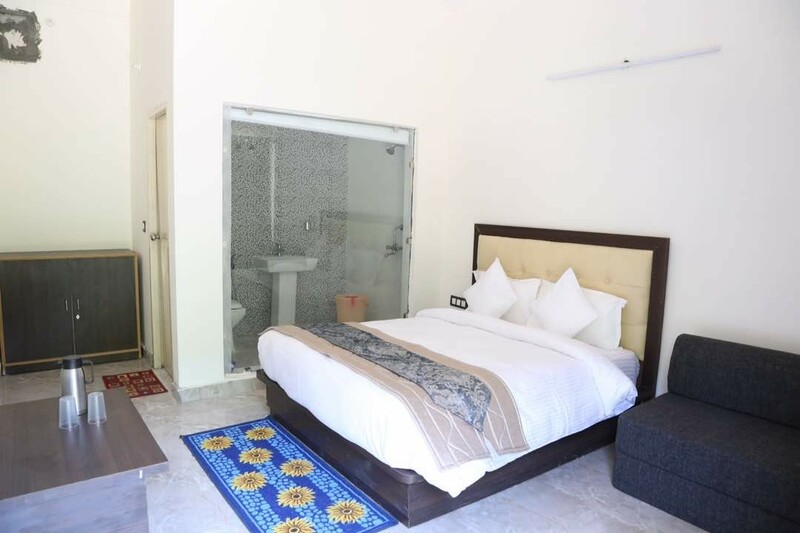 You'll be staying in an air-conditioned cottage on twin sharing basis, with an attached washroom, private sit-out. You'll have a cosy bed, soft mattress, quilts and pillows. 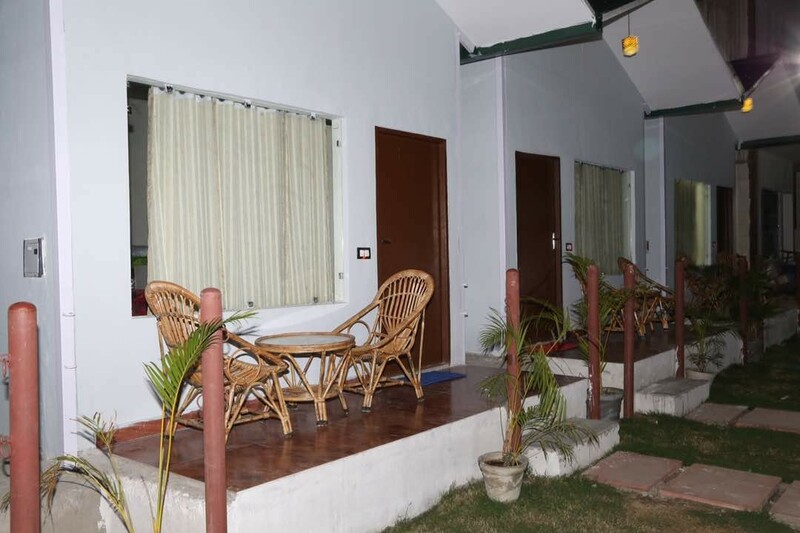 Check in to a comfy, well-appointed cottage in Rishikesh. You'll eat a hearty breakfast before heading for your rafting adventure. You'll be served aloo paratha/puri sabzi, curd, pickle, bread, eggs, tea and coffee. You'll check out after breakfast. Trip ends here. Wake up to a misty morning at your campsite. 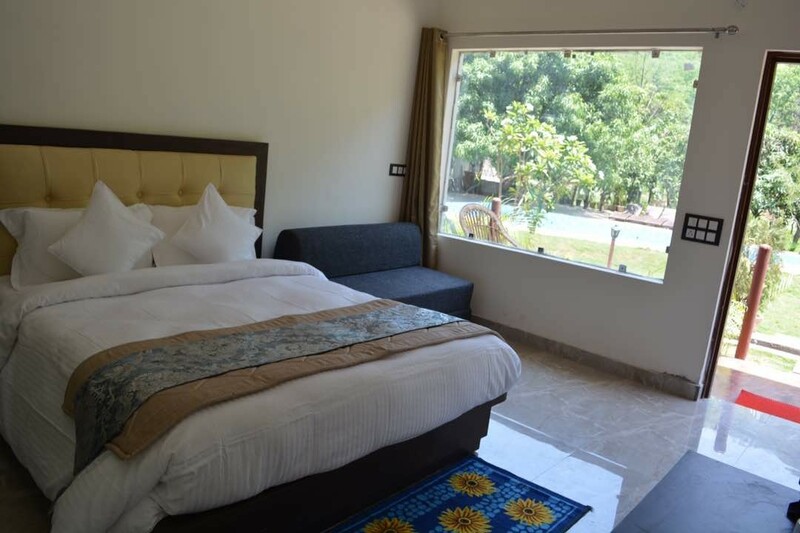 The campsite lies on Neelkanth Road in Rishikesh. You can get to Rishikesh by air (Jolly Grant Airport in Dehradun, 50 kms away) or by road from Delhi and Chandigarh.